The line graph below shows the monthly ridership of four separate transportation forms in a European metropolitan area between 1980 and 2030. Summarise the information by selecting and reporting the main features making comparisons where relevant. The line graph compares figures for monthly travel by commuters in a European urban area using four means of transportation (subway, tram, bus, bike share) over a period of 50 years. Overall, although the subway was certainly the most popular means of transport throughout the period, other forms of travel became increasingly popular, while bus usage declined. In 1980, subway ridership, which totaled 2.5 million people, increased to 3.5 million by 2010 before being projected to rise significantly to 4.5 million by 2030. On the other hand, bus ridership, the second most popular way to reach work fifty years ago at around 1.6 million, has steadily fallen and is projected to further decline after 2020 to under 1 million users by 2030. Of other transportation forms, Tram usage should increase the most significantly. From less than a quarter of a million people in 1980, tram commuters overtook bus riders in 2010 and are expected to increase to over 2 million by 2030. Meanwhile, although bike share use didn’t become popular until 2000, its yearly rise since then is anticipated to begin to challenge bus ridership by 2030. Summarise the rise in popularity of hamburgers and fried chicken, along with the fall in pizza consumption. Introduce the key change of the increase in hamburger consumption. Passive and Active tense are used here. “Likewise” is similar to “like hamburgers” and means in the same way as the last thing mentioned. Use “although” to show a concession and “from” and “to” to add information. The line graph compare figure for monthly travel by commuters in European urban area using four means of transportations (subway, tram, bus, bike share) during period of 50 years. Overall, although the subway is certainly the most popular mean of transport throughout period, other form of travel becoming increasingly popular, while bus usage declining. In 1980, subway ridership, which totaled 2.5 million peoples, increasing 3.5 millions by 2010 before projected to rose significant to 4.5 million by 2030. On the other hand bus ridership, the second most popular way to reach work fifty years ago around 1.6 million, has steadily fallen and is projected to further decline after 2020 to under 1 million users by 2030. Of other transportation forms, Tram usage should increase the most significantly. From less than quarter of million people in 1980, tram commuter overtook bus rider in 2010 and are expected to increase to over 2 million by 2030. 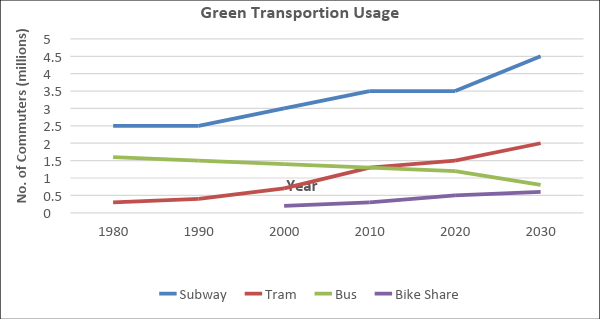 Meanwhile, although bike share use didn’t become popular until 2000 its yearly rise since then was anticipated to begin to challenge bus ridership by 2030. Which form of transport is the most popular over the period? What is the least popular during that time? How can the categories be grouped together to construct two body paragraphs? Since we’re looking at a long time frame here, we can consider 1980 until 2010 when there was some change bus and tram. Then from 2010 to 2030. Alternatively, we could look at two sets of categories in one body paragraph, and the other two in the second paragraph.